It is all too easy to judge and run with your uninformed pre-conceptions of what this phenomenon may actually be. It is so much more than you could imagine. Is this a new religion or merely a fantastical escape from the harsh realities of the world? Or as this documentary would have you believe. Directed by Laurent Malaquais, the makers are all bronies and clearly set out to make a doc showing how amazing this world is. Childlike naiveté or simply doing what they like and harming no-one in the process? 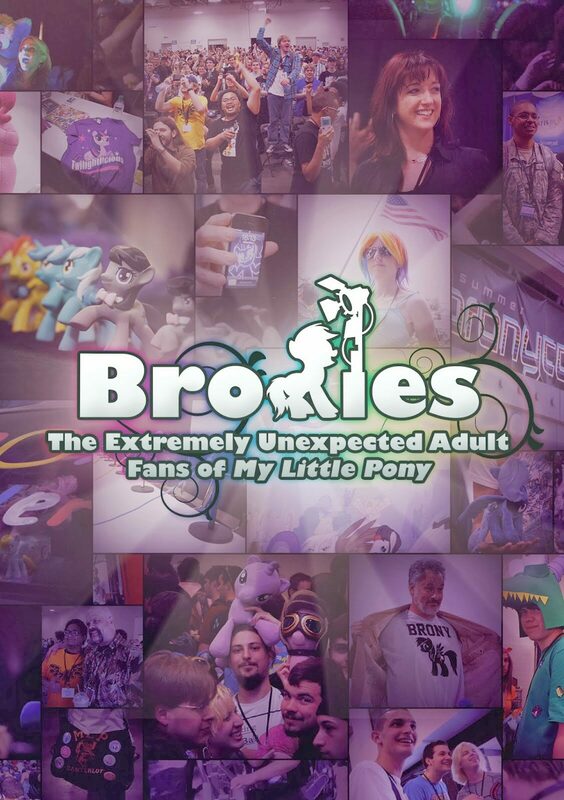 Financed by the bronies on Kickstarter, this was always gonna be an “Isn’t being a bronie awesome” film. John De Lancie (Q from Star Trek :TNG) narrates and is featured as he is also the voice of Discord, the bad guy from the Pony series. I’m not a Bronie, I have no desire to watch the show or listen to the music but am definitely down with their core values that they seem to be putting into practice and living them willingly and happily, if you are to believe this totally biased documentary. More than a mere moral code that one may pay obeisance to, an actual living experience. I wonder about the dark side to this world, or at least the less than squeaky-clean version (clopping on 4 Chan, Rule 34, anyone?). This doc is definitely pandering to the fans. I would have liked to have seen a more balanced, less sycophantic documentary that delved deeper into the psychology of the movement. On the outside it’s easy to see the plus side. These men, not content with the world they live in have found a place where they can express themselves five-year girls would do. I get it. The world is a scary place at times and not everyone is equipped to navigate their way through the rapids of everyday life. Environment, education, being surrounded by no family or a lack of connection can lead to a feeling of exclusion. Maybe the sheer escapism is just that, the denying of darker side of life or by focusing on the positive manifest creating the world they wish to live in. A wonderful chance for introverts to express themselves and escape from the scary, unsettled way the world is but in doing so teaching them how to interact with others and instill a sense of morality that is a welcome change with them being filled with compassion and kindness, friendship, love and connection. Men being allowed to access their feminine sides, this is a great thing albeit slightly misguided. Most of the bronies here are heterosexual which erases the idea that they are all leaning towards the feminine in a sexual nature. Emma Watson recently gave a talk at the U.N. about feminism and gender equality. Harry Potter Girl at the U.N.
It’s time for the world to embrace the divine feminine for sure and if some of these dudes do it this way, fair play. Michele Arroyo, the mother of Grayson, a 12 year old boy who was diagnosed with a terminal brain tumor at 6 years old “People who don’t like or hate the Bronies, have no idea what the group is about. They look outside of themselves and are doing things for other people” The bronies sent him messages of support and raised money for him. Nowadays with people breaking away from the societal stereotypes, dressing up at festivals, expressing themselves in ways that deviate from the norm and embracing their inner selves, unburdened by the shackles of modern society. This review has stumbled onto something far more interesting than dudes who like My Little Pony, more an investigation about gender roles in society and how we can learn from unconventional societal norms and how they may eventually free us to express our true natures, both masculine and feminine; the Ida and the Pingala, that exist in us all, men and women, boys and girls. Having said that, this doc is so partisan that it is sometimes hard to swallow. It is interesting but not incisive enough, unfortunately.